1 base point for each grid square activated outside your home grid square using a single-channel FM satellite transponder. 2 base points for each grid square activated outside your home grid square using a linear (SSB/CW) satellite transponder. 1 additional point added to each grid square score for activating a state, province, or DX entity outside your home entities. Example: Activating 1 grid square on SSB outside your home DX entity = 2 + 1 = 3 points awarded. 5 additional points for advertising your grid operation using an open and public social media account, tagging @amsat or #amsat at least 24 hours in advance of the activation. These additional points are not multiplied for grid boundary operations. If you operate a two or four-way boundary, only 5 additional points are awarded. Advertisement via the AMSAT-BB email listserv or AMSAT News Service (ANS) will count for this bonus. 5 additional points for photographing your grid operation and posting them afterwards using an open and public social media account, tagging @amsat or #amsat. These additional points are not multiplied for grid boundary operations. If you operate a two or four-way boundary, only 5 additional points are awarded. 10 points for activating a grid square while operating Maritime Mobile (/MM.) This will also result in a /MM endorsement on the award. This supersedes any base point calculation based on mode. 15 points for documenting your grid activation in an article published in the AMSAT Journal. The article must document the planning of your activation, equipment used, and general comments on the lessons learned from the operation. 2. For this award, your home grid is defined by the record of your licensing authority. 3. Two and four-way grid boundaries will count as a multiplier to the qualified points based on mode (FM, SSB/CW, or Digital.) Examples: Two-way grid boundary operated on SSB = 2 x 2 = 4 points awarded. Four-way grid boundary operated on FM = 4 x 1 = 4 points awarded. 4. Eligibility for this award is based on portable satellite operating on or after January 1, 2018. 5. To claim an activation of a grid square, you must complete at least one confirmed two-way QSO from that grid square. You may earn points for activating a grid square on each mode defined above, but must complete at least one confirmed two-way QSO on each mode claimed. Once you have claimed an activation of a grid square on each mode, you may not earn any more base points or bonus points for an activation of that grid (unless you activate another state, province, or DXCC entity from the same grid). Either LoTW QSO detail screenshots or scanned QSL cards may be used as confirmation of an activation. The LoTW screenshot or scanned QSL card must indicate your grid square and satellite used (and complete station location information if you wish to claim extra points for activating a grid square outside your home state, province, or DXCC). Screenshots or URLs of appropriate social media postings for bonus points must indicate grid squares and/or entities activated. Note: For the purposes of this award, state means any U. S. state plus the District of Columbia. Province means any Canadian province or territory. DXCC entities are as defined on the ARRL DXCC list. 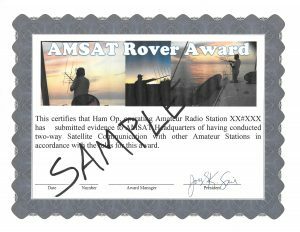 To apply for this award, email your score calculation, details, and required evidence to kk5do@amsat.org. A scoresheet is in development, but is not required to apply for this award.